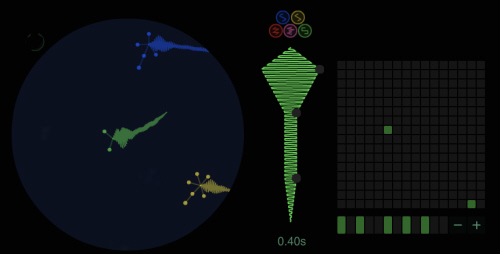 Seaquence is an experimental musical petri-dish. Seaquence allows you to create and combine musical lifeforms into unique, dynamic compositions. The way each creatures looks and sounds is determined by the step-sequencer pattern, and other parameters you can tweak including their audio waveform, octave, scale, melody, envelope, and volume. You can add multiple creatures to your dish and the combination of different creatures results in unique compositions that always change due to the creatures movement. Click on 'learn more' to find out how to play.